When we think of the Spartans, we imagine these Ancient Greek soldiers as being experts on the battlefield and having bodies to die for in this online slots UK game. These pinnacles of men were known for their brilliant stamina and unbelievable strength. Do you think that you would have what it takes to join this extraordinary league of men? 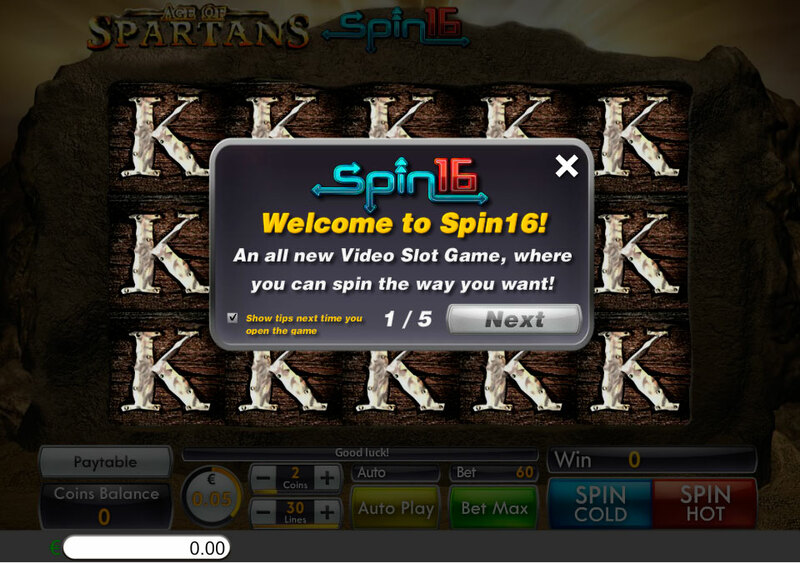 Well, now you can play the Age of Spartan Spin 16 slot game. Coming from the global gaming firm Saucify, Age of Spartans has everything that you would expect from a battle-themed game. The graphics are quick enough to keep up with the action, and there is also a bold soundtrack to match. Saucify’s team of developers are known for their terrific premium games, all of which have had gamers hooked for quite some time already. Now they’ve brought out Age of Spartans to stand alongside their other slots such as Break the Bank and Digging for Dinosaurs. So, why wait any longer – it’s time to spin those reels! Get the best out of our offers for slot games before you play the game! Put on your finest armour, polish your shield and sword and prepare to meet all of your fellow Spartans on the battlefield. This bracing slot takes place right amongst the action. The game board has is on top of a large boulder and features five reels and a tantalising thirty pay lines. Letters and numbers make up lower symbols as usual while the higher ones are represented by all things Greek. You’ll see Spartan helmets, large battalions, and arrows raining down onto shields. Don’t be scared, though, there are some bonus features that can help you through the battle. FREE SPINS – If you manage to spin three, four, or five of the Scatter symbols onto the board, you will win some free spins. Spin the maximum number of Scatters, and you will win some extra game coins as well. SPIN 16 – One of the features that sets the Age of Spartans Spin 16 slot ahead of the pack is all to do with the last bit of its name. The Spin 16 features is revolutionising how slots are played and you’ll get to try it out in this game. It simply gives you the chance to change the direction you spin your slots – you can even start spinning across if you want to. This then greatly increases your chances of spinning some of the higher-value symbols.